Mountainous coastlines vs drought ridden desert. The lavishly rich vs the street begging poor. 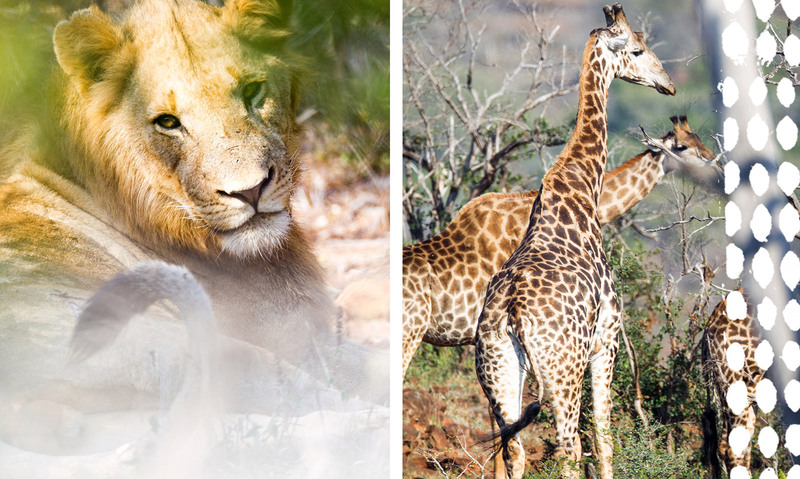 The wildlife of the savannah vs the wildlife of the city. No other country in the world boasts such dramatic contrast. We piled in the rental vans and road tripped from the bottom to the top. 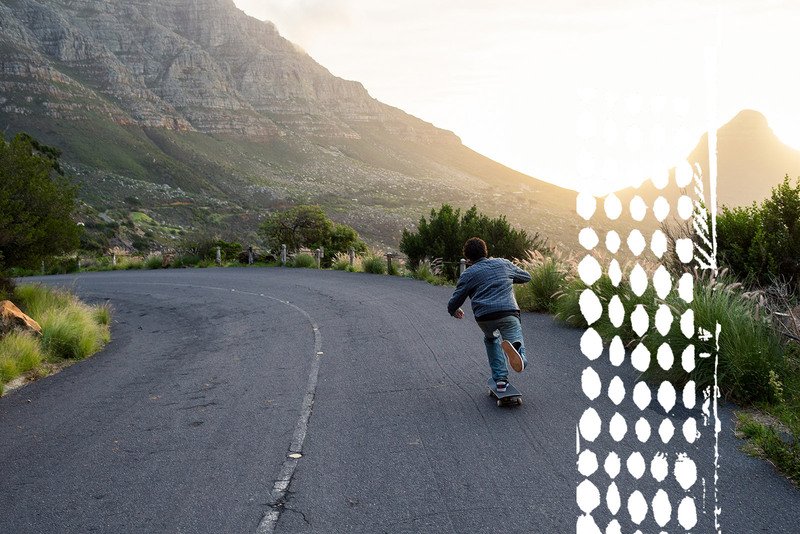 Surfing perfect point breaks, bombing hills, eating biltong and living in the "now now"
We live in a day where the lines are blurred. 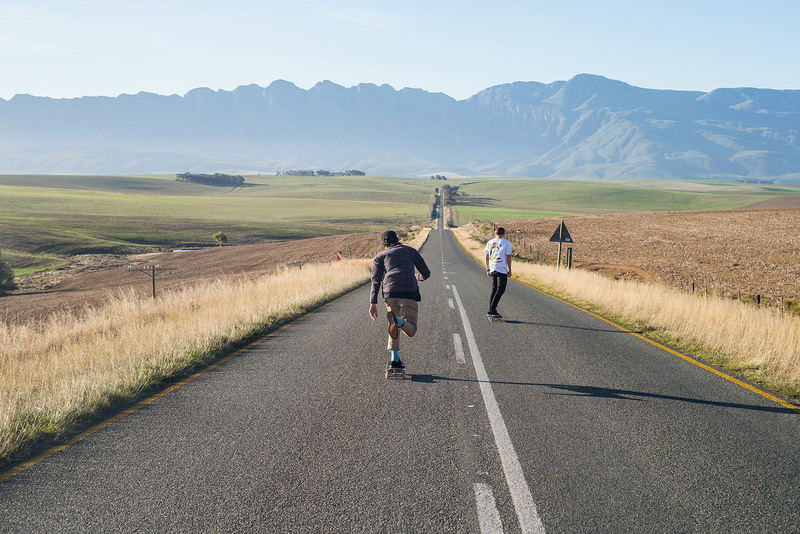 When the surf is flat, we get our fix riding concrete. If the waves are firing, we trade wheels for fins. And if the weekend forecast is for blue skies and fresh powder, we mission it to the mountains. 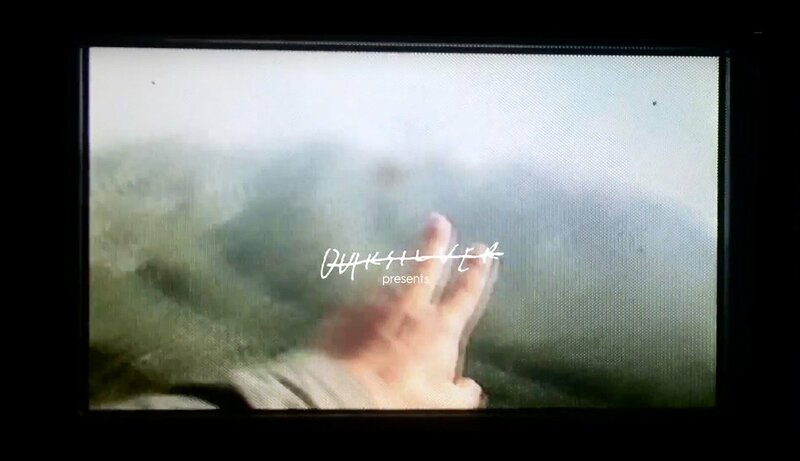 The quiver runs deeper than just swallow tails and thrusters, skaters no longer simply live for the streets, and snowboarders don’t hibernate in cabins waiting for the next winter to hit. We are Boardriders. We ride it all. All shapes. All conditions. All day. We are artists, photographers, musicians. 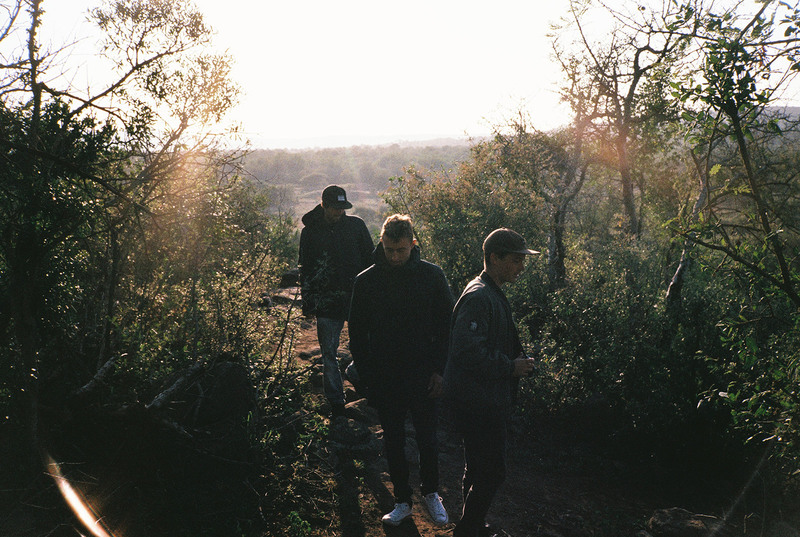 We love to travel, to party and to ignore any advice to "take our time and be careful". South Africa, let's do this. 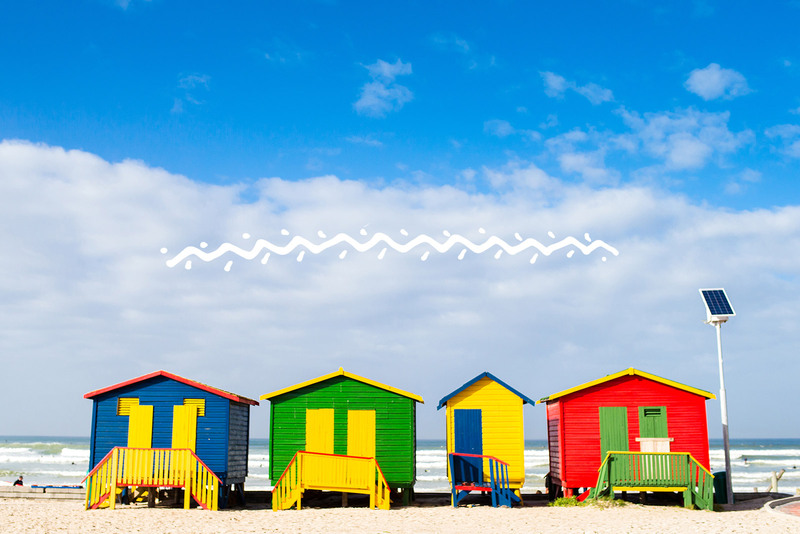 We landed in Cape Town, the “Mother City”, a melting pot of vast history, diverse culture, limitless cuisines some of mother natures very best work. As the clouds cleared we were left struggling for breath. Huge mountainous landscapes tower above the city creating an amphitheatre of absolute beauty. 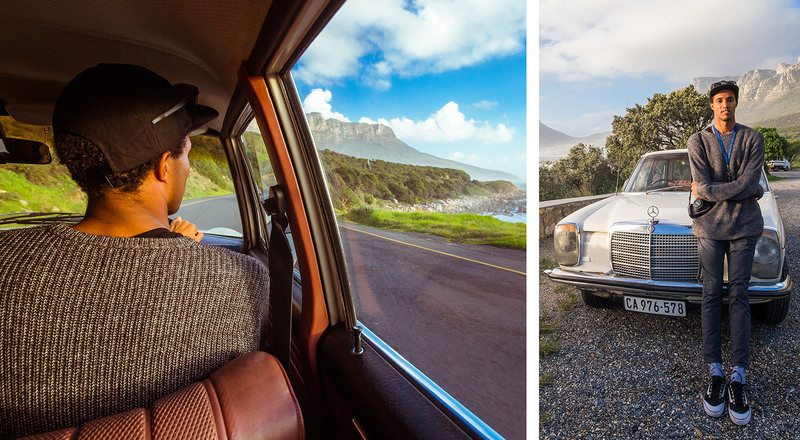 We cruised, Long Street, the main artery in town and found ourselves ordering coffee in modern cafes, eating at stylish restaurants, and an eclectic range of stores. 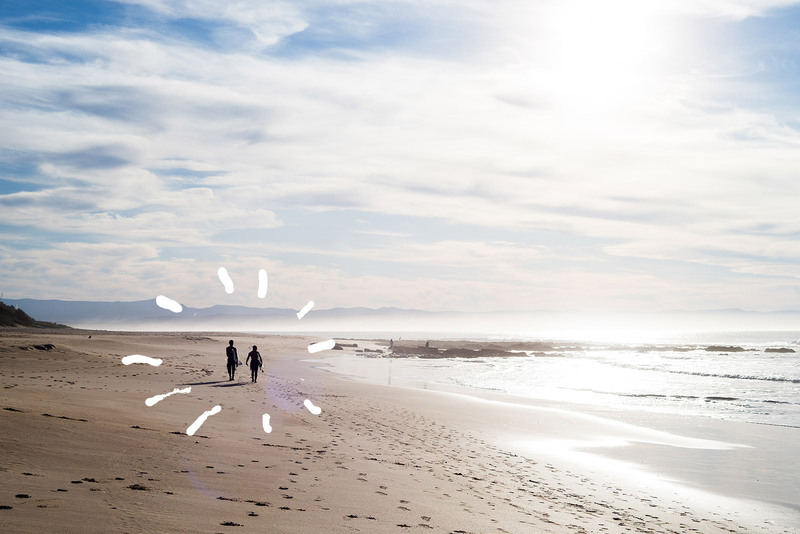 It’s no mistake that Cape Town takes the cake for not only the most popular tourist destination in South Africa, but Africa as a whole. It's one lakka city. 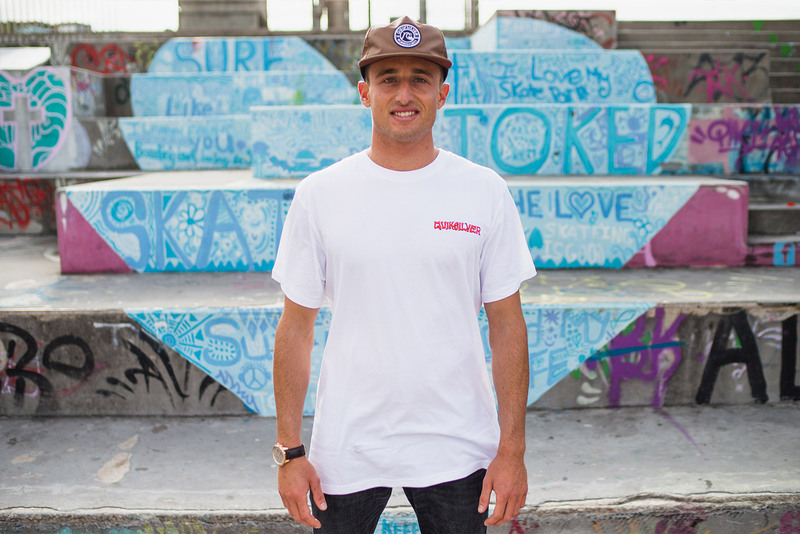 Professional Surfer / Tour Guide - Mikey February grew up in Cape Town and still calls it home today. He showed us the streets, he showed us this place. 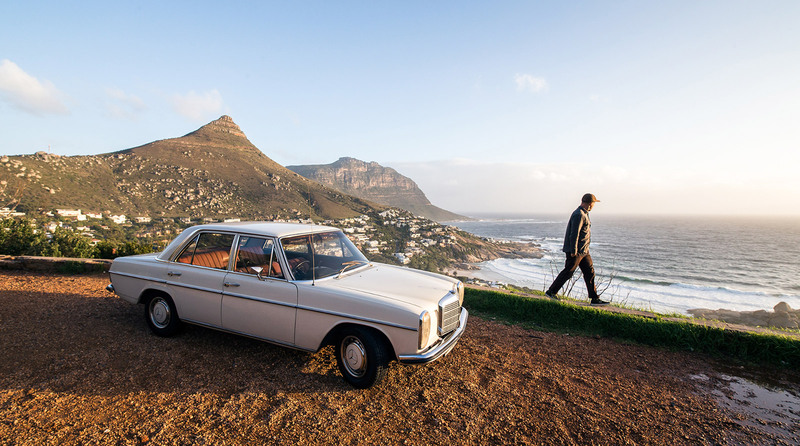 We did in stlye as we cruised the coast in his 1972 Mercedes Benz 220. 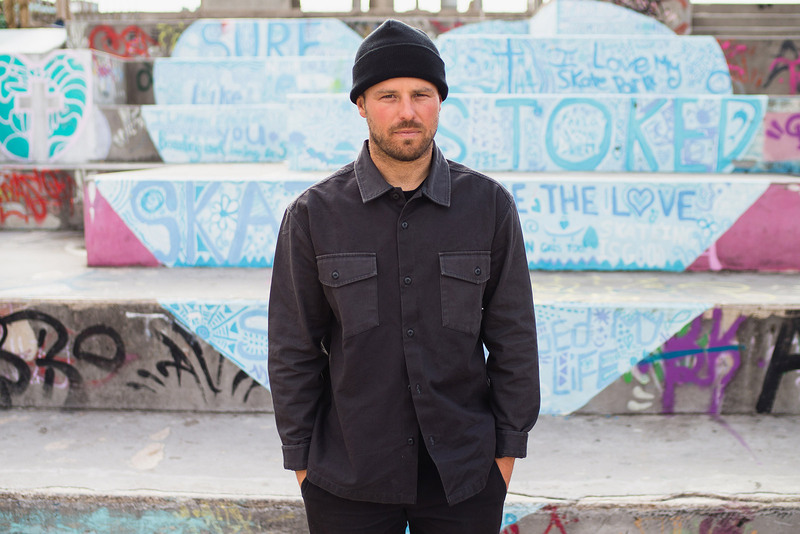 Professional Snowboarder - Bryan Fox. You’ll know it when you see it. 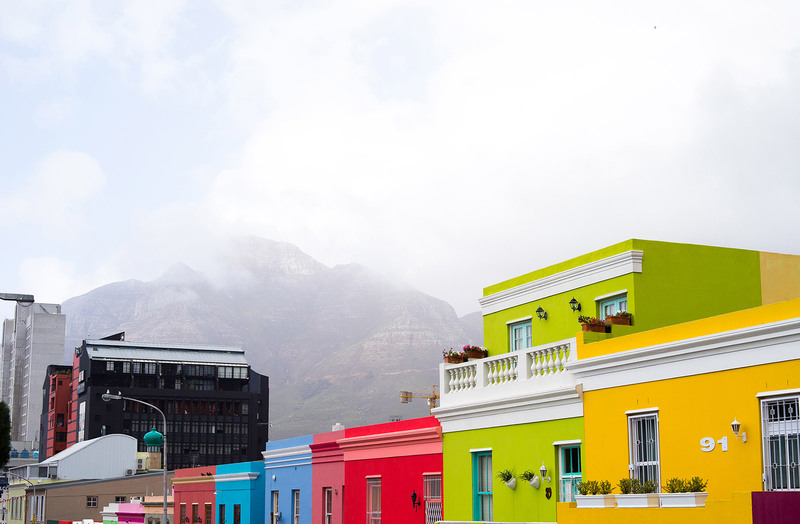 Brightly painted buildings in every colour of a packet of skittles. 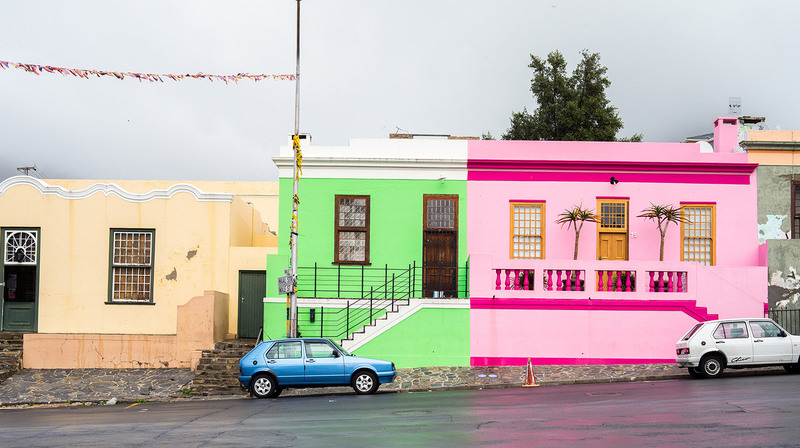 Transformed today to create a village feel, this Cape Town suburb was originally formed to house slaves from Malaysia, Indonesia and Africa who were imported to the city by the Dutch in the 17th and 18th centuries. Those vibes are long gone and it’s nothing but smiles and rainbows now. Standing proudly above Cape Town, Table Mountain cannot be missed…literally, is a massive mountain that you cannot ignore. 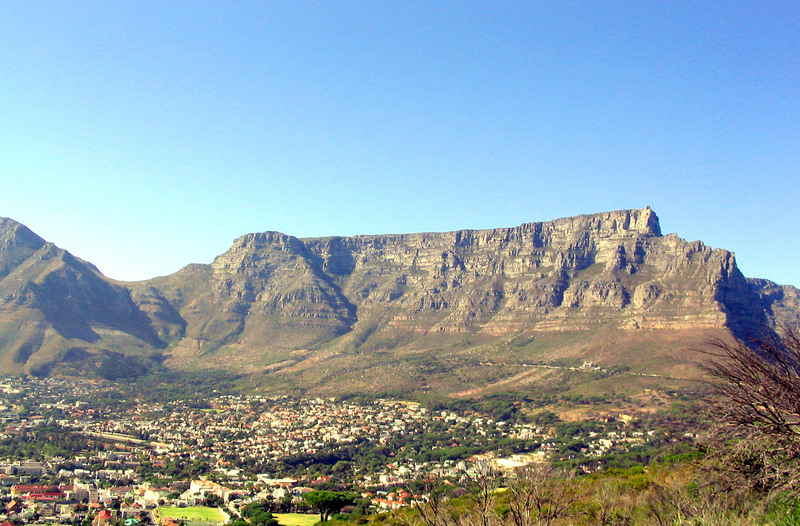 Named due to its large flat plateau top, the ridge of Table Mountain spans almost 3kms in width. You can hike it to reach the top or use the cable car if you're a little less adventurous. 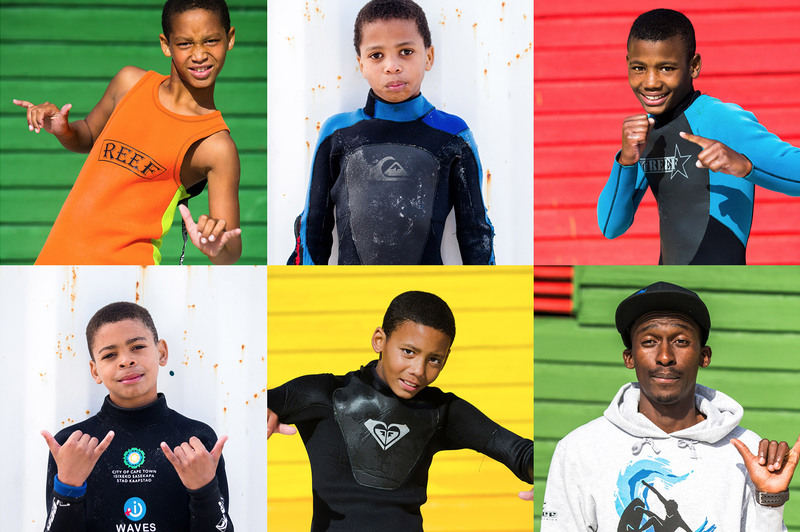 Waves for Change is a program founded in Cape Town developed to help and improve the wellbeing and emotional stability of young kids who’s lives have been effected by violence and abuse. 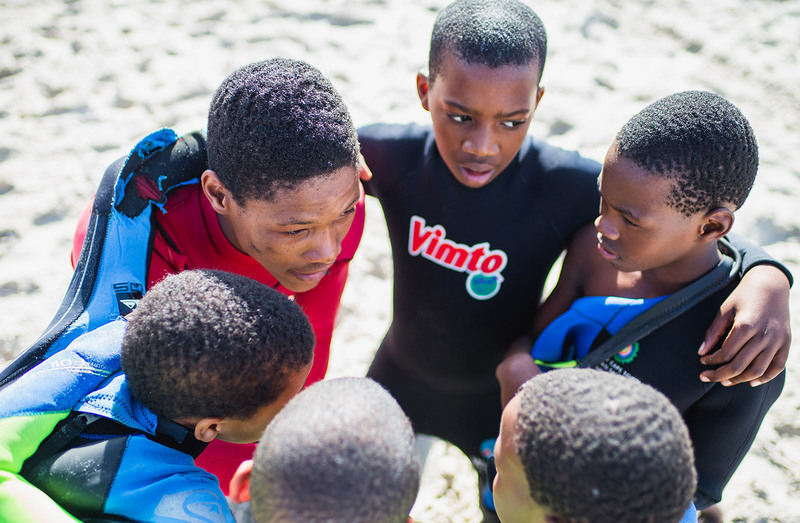 Run by a team of surfers and mental health professionals they developed a program using what they call "Surf Therapy" teaching water safety skills and the basics of surfing to help these amazing kids develop skills and techniques to deal with stress, build relationships and make positive life-choices. 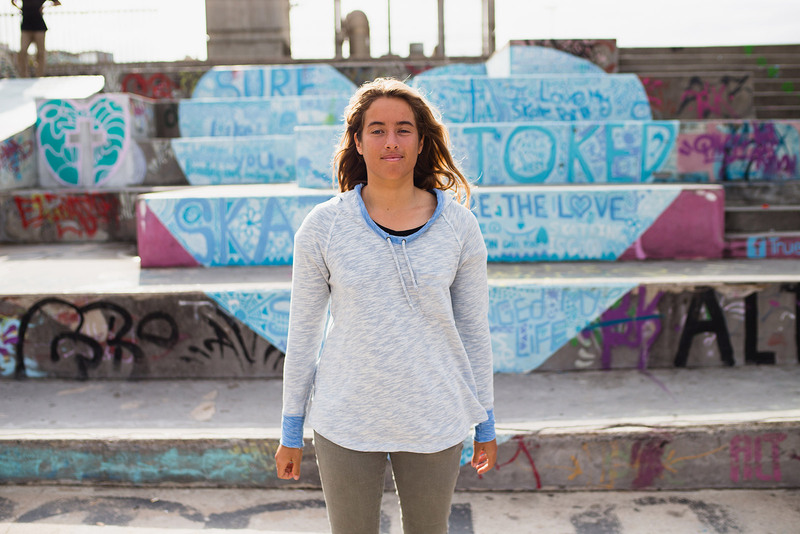 Mikey February is a proud member and one of the amazing couches at the Waves for Change program in Muizenberg. Cape Town. Along with the other coaches they are changing lives for the better. 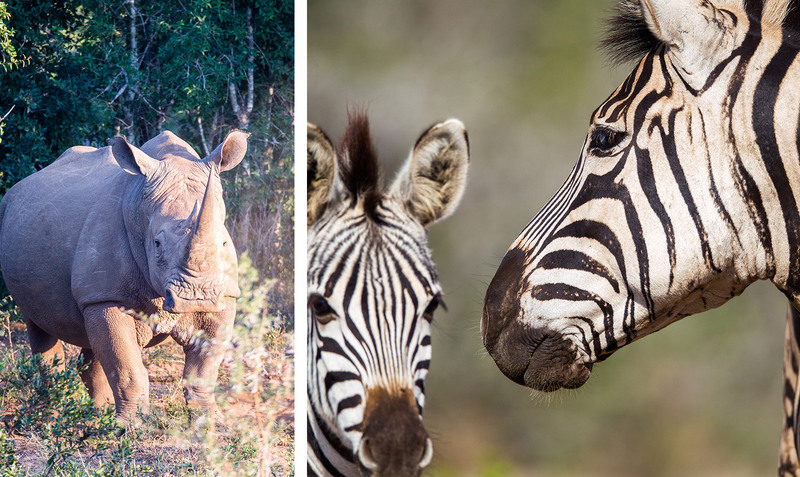 The Garden Route set the stage for a perfect road-trip vacation. 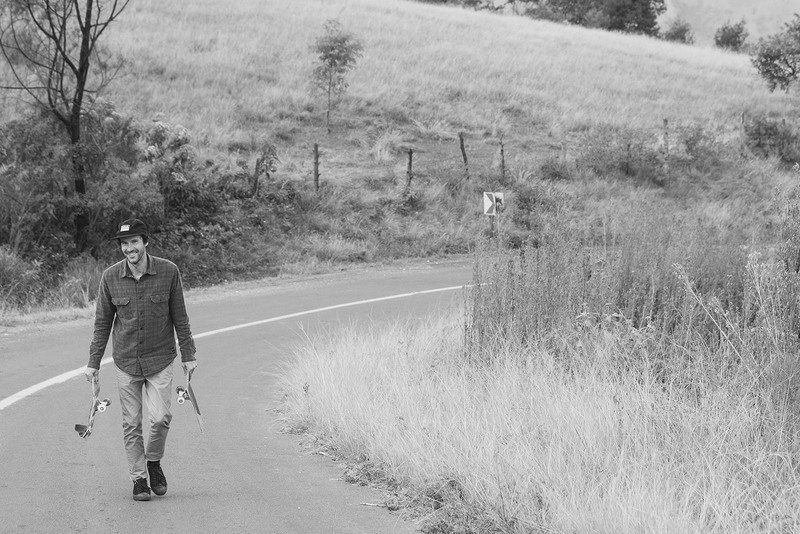 We piled in the vans and set our compass to north-east. Take a photo. Review the photo. Repeat. 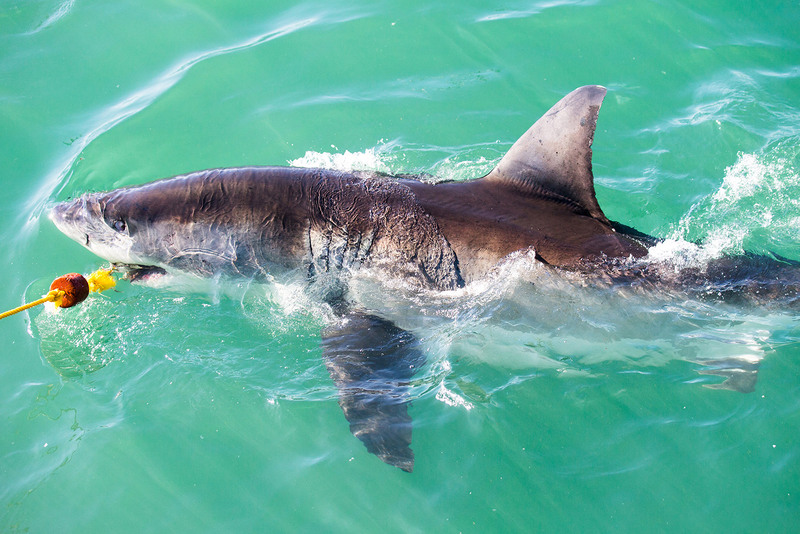 Shark Alley, South Africa is home to one of the largest population of Great White Sharks in the world. 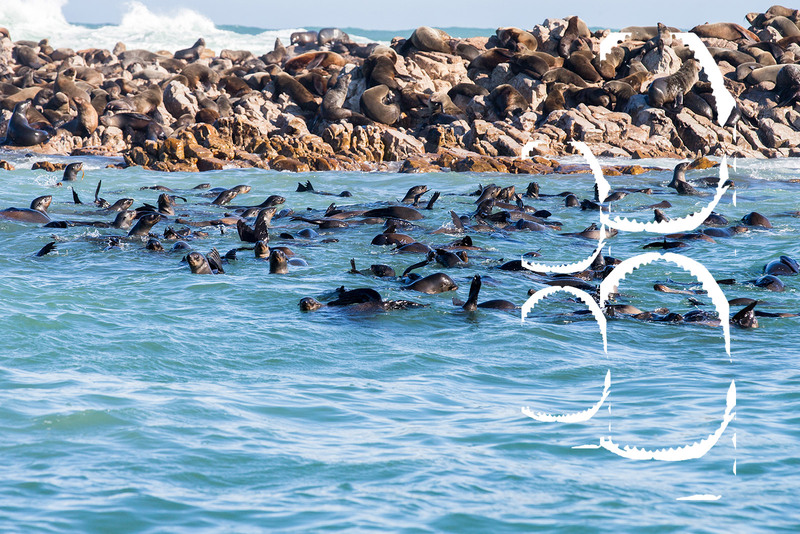 This narrow channel of ocean hosts a breeding ground for over 60,000 fur seals per year, luring the Whites for what is basically an all-you-can-eat buffet. The cage diving here is some of the best on the planet. An experience that allows you share the water and get up close with these amazing creatures. 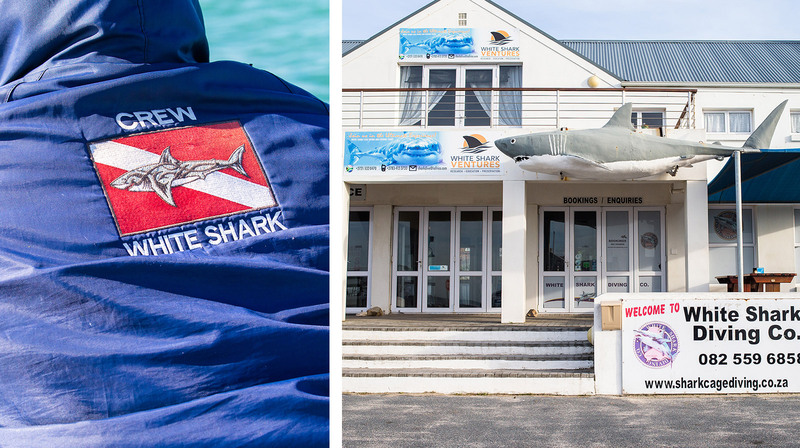 The guides who operate the tours in Gansbaai, dedicate their lives to the conservation and well-being of Great Whites. Contrary to popular belief cage diving has no impact on the Sharks lifestyle or habitat. Pretty much the exact face of anyone who gets in a shark cage. If you need an introduction to this wave…you probably shouldn’t call yourself a surfer. 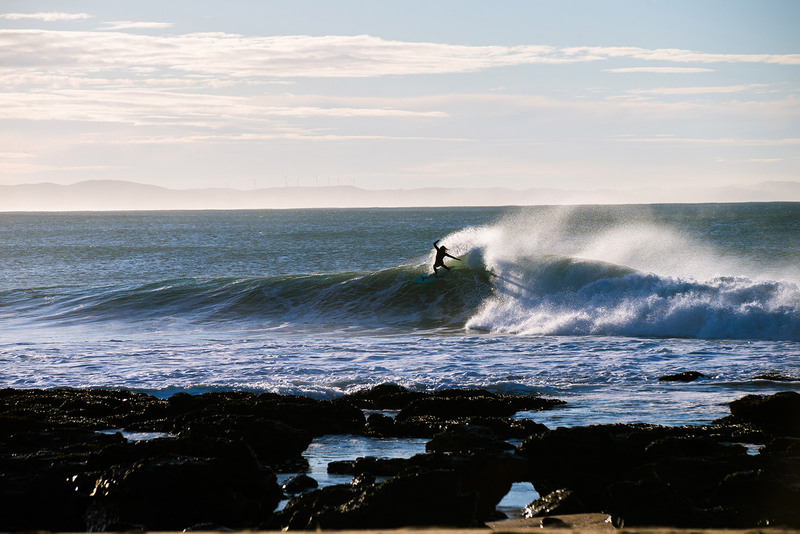 First surfed in 1964 by South African surf pioneer’s John Grendon and Muphy Bokhorst, Jeffrey’s Bay is a regular footers dream. 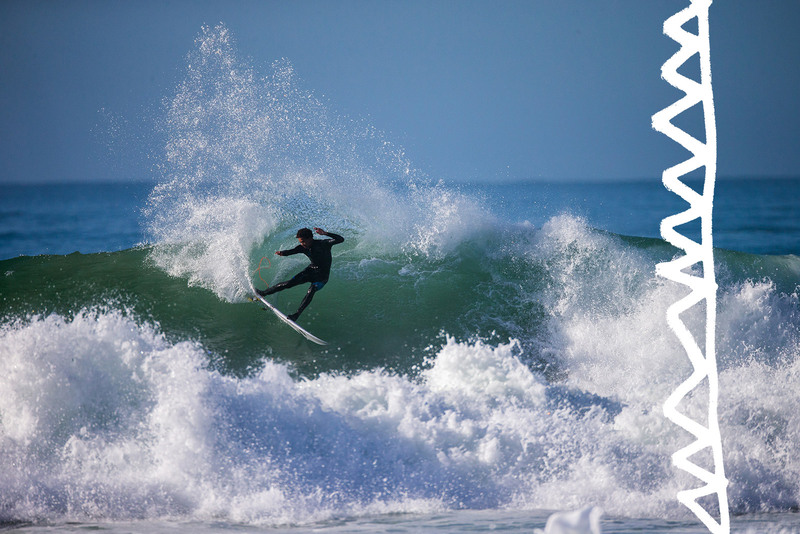 Home to one of the longest, most perfect righthand point breaks in the world, the wave is brokem into 5 different sections. Up the very top is Magnatubes and Boneyards, both fast and hallow, then Supertubes. 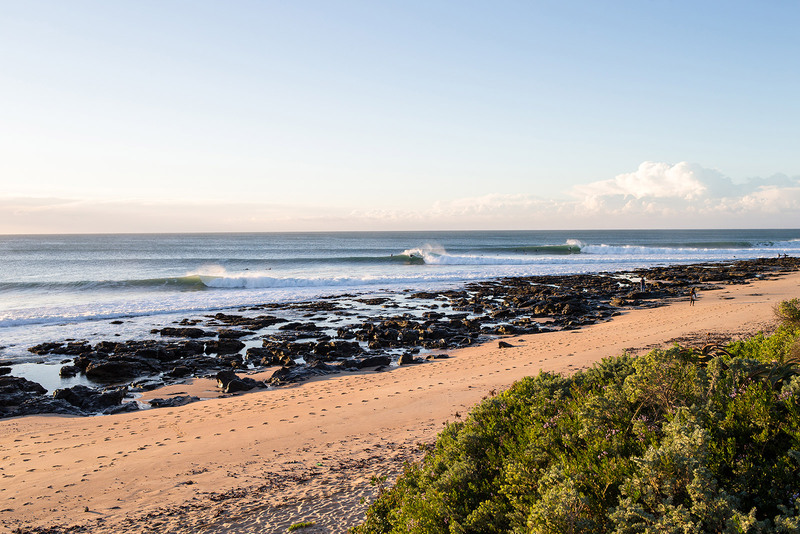 This considered the “main peak” of J-Bay, and is where you'll find most of the pack sitting, waiting for the wave of their life. 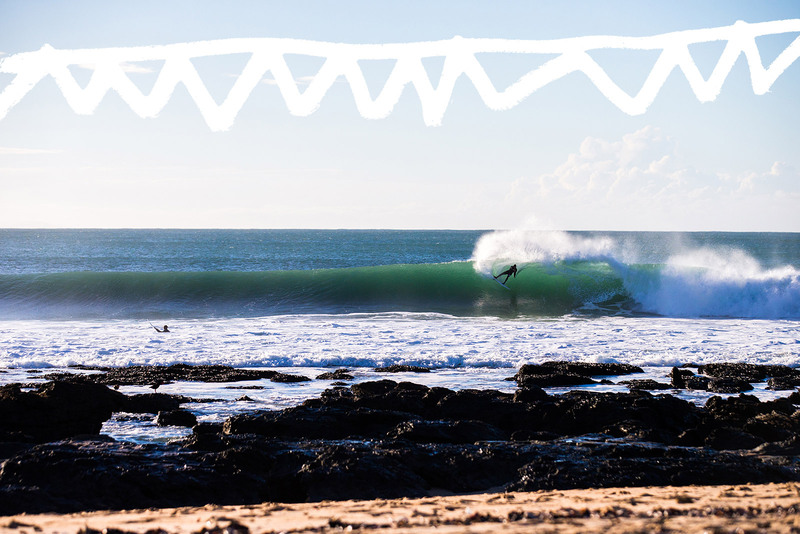 Once you score one you’ll highline your way through Tubes and eventually, (if you get a long one) into Point. 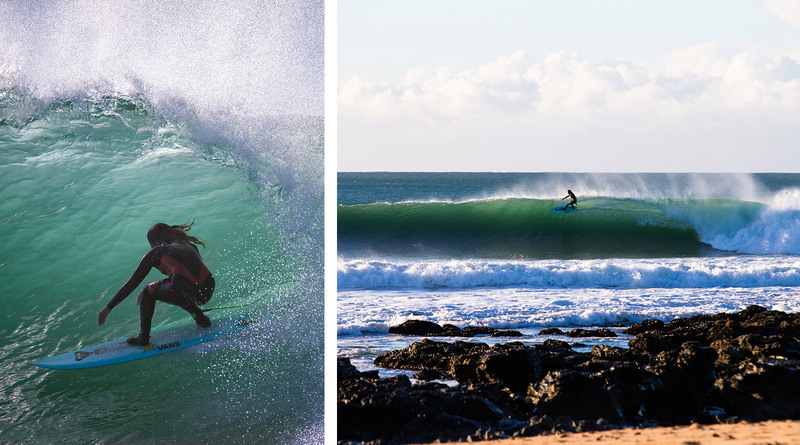 For a flawless example of how to surf J-Bay, Google: Tom Curren - J-Bay. Absolutely incredible. 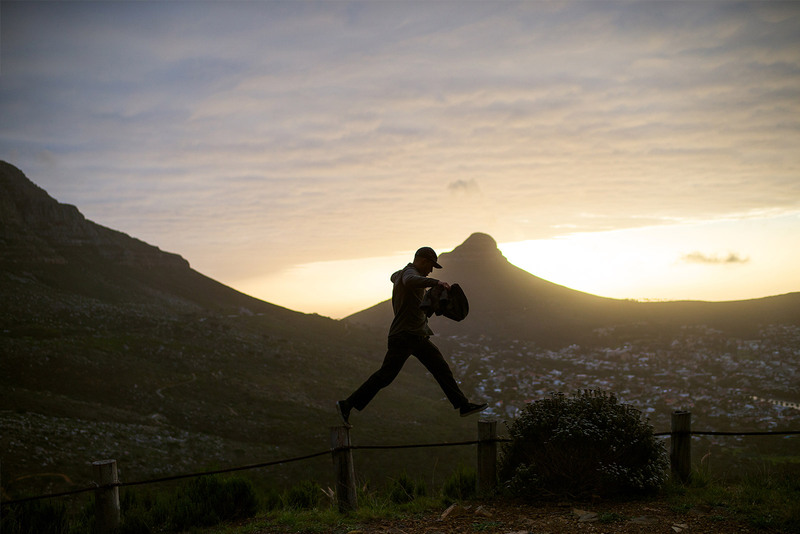 Resident tour guide and South African style-master Mikey February showed us how it's done...the local way. 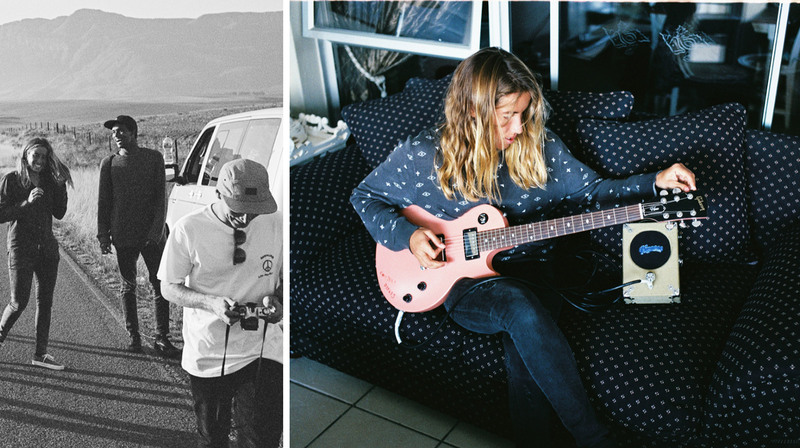 In unwashed clothes and rubbish filled vans, we arrived at the final destination of our South African roadtrip. 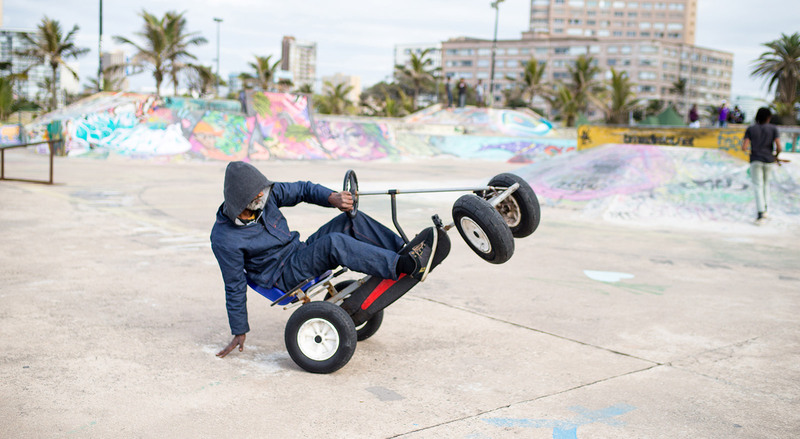 Gritty, raw, and jammed with attitude, Durban City is over-flowing with culture and vibe. Art deco architecture stands tall above the waterfront that is dancing loudly to the African beat. 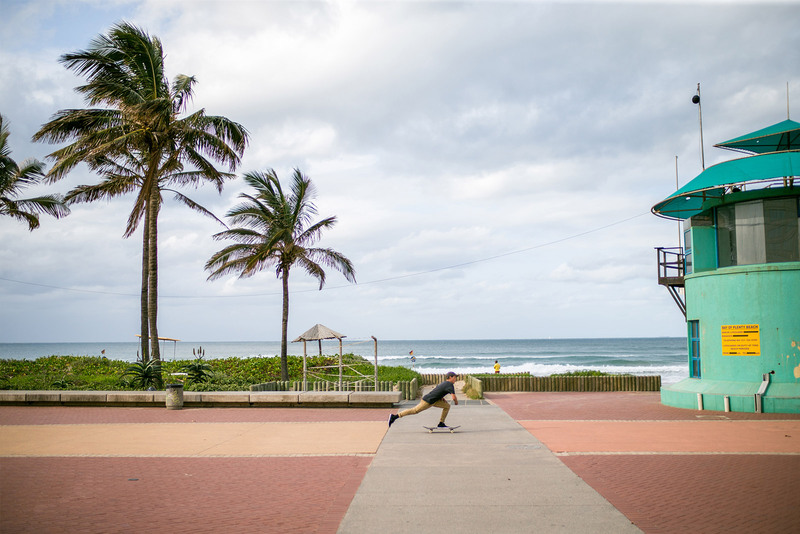 A population of over 3.5 million call Durban home, settling here for the year round warm weather and a city that knows how to party. 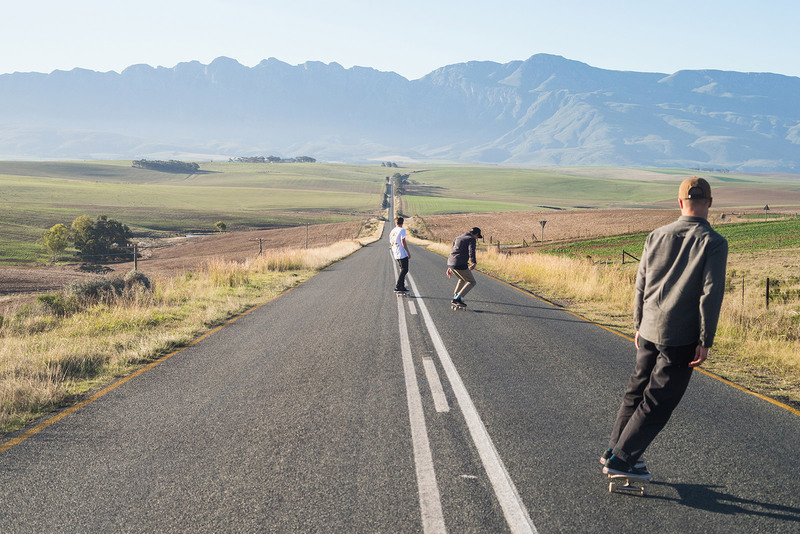 We found concrete to skate and waves to surf, animals in the wild and the Zulu vibe. 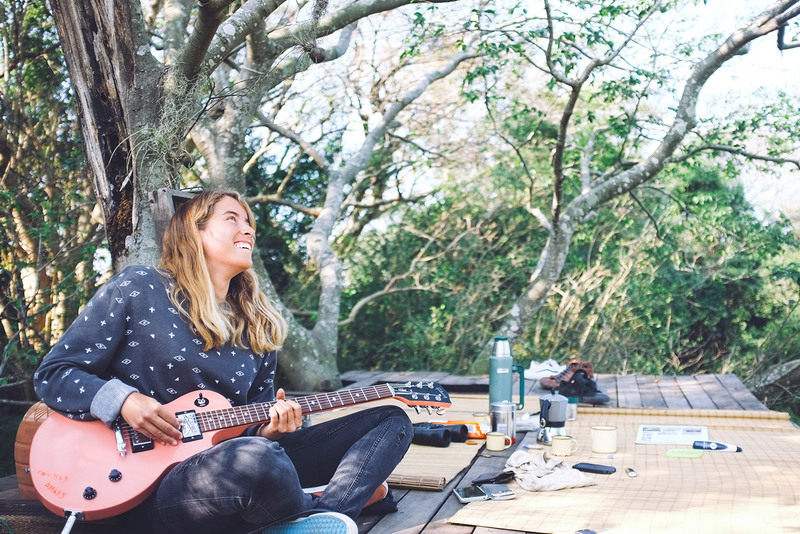 We came for the sun and left with a camera roll full of good times. 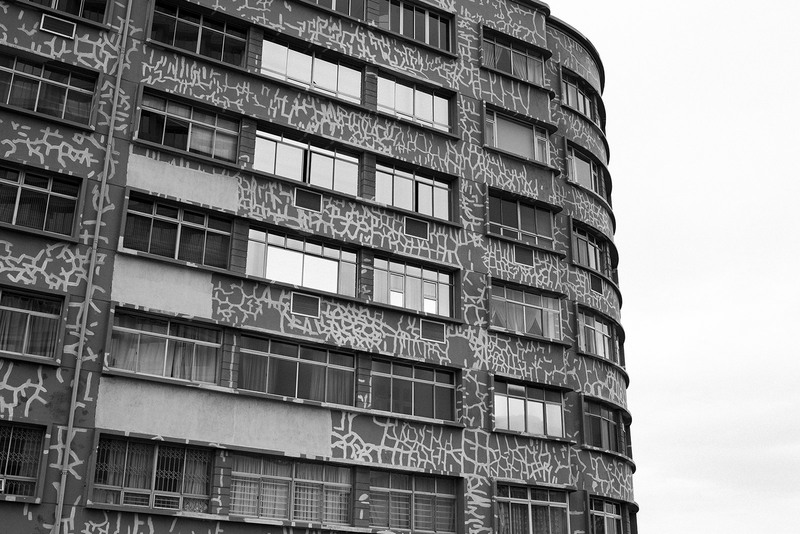 Zach Miller / Javi Mendizabal - Animals at home in this urban jungle. Yep, exactly what you would think, a valley with a shitload of hills. 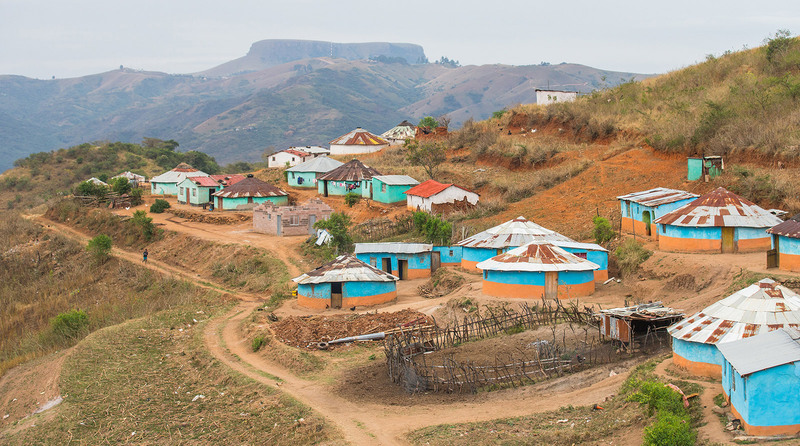 Situated around 45mins outside of Durban, this is where the real South Africa is. 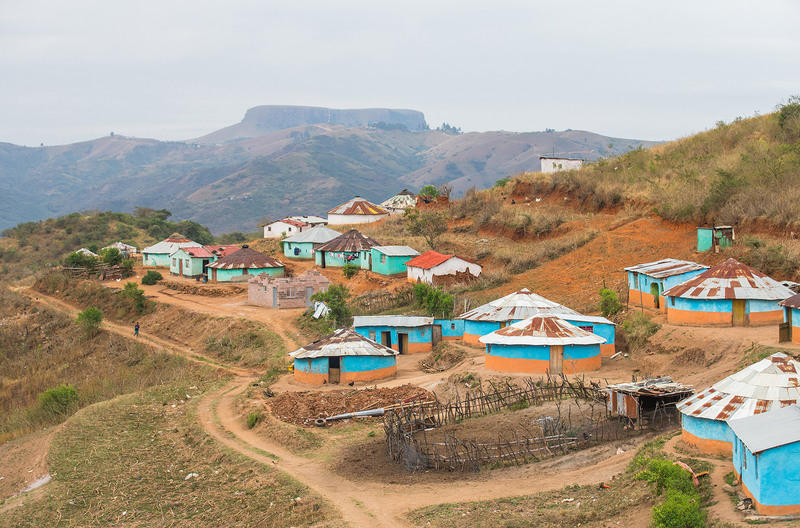 Away from guttered roads and convenience stores, The Valley of 1000 Hills is home to the indigenous Zulu people. Having lived here for centuries, their traditions and rituals remain, alongside some of the most dramatic, untouched landscapes you’ll ever witness. Matt Banting. 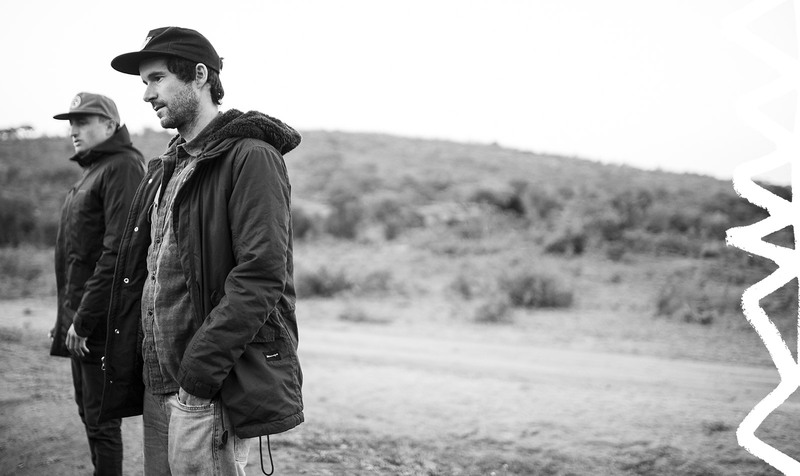 Javi Mendizabal - Before the lions. 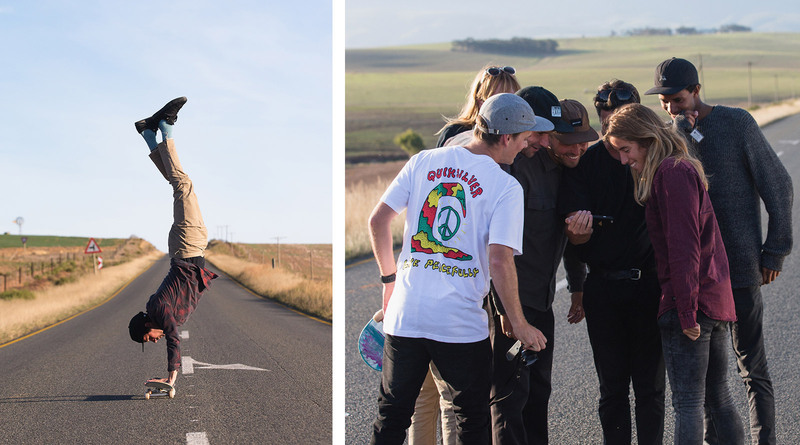 "It was the first time meeting Zach for all of us…He literally joined the Quiksilver team 2 days before the trip kicked off! 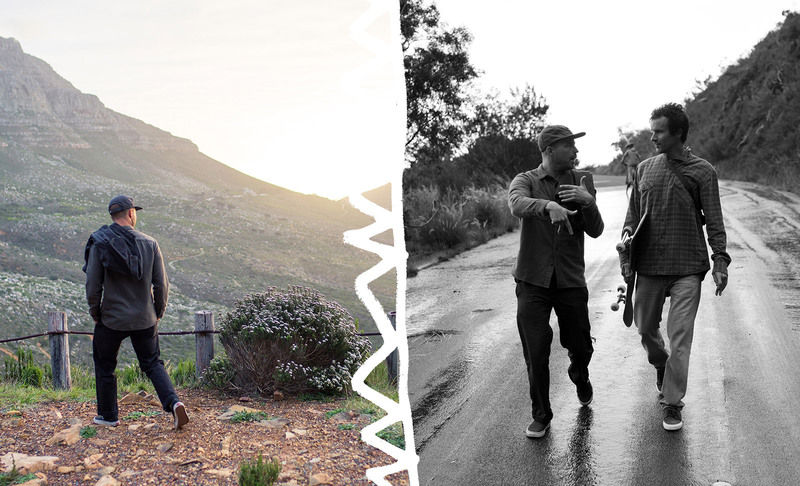 Even though he didn’t know anyone before landing in Cape Town, he instantly fit in and felt like he had been apart of the gang forever. 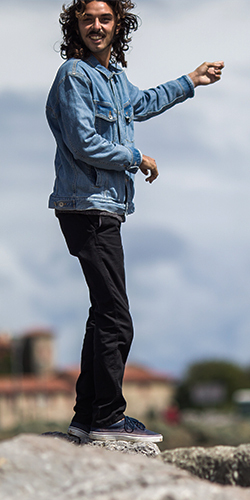 Zach is an all terrain style-master and all-time positive human…Stoked on land, stoked in the water. 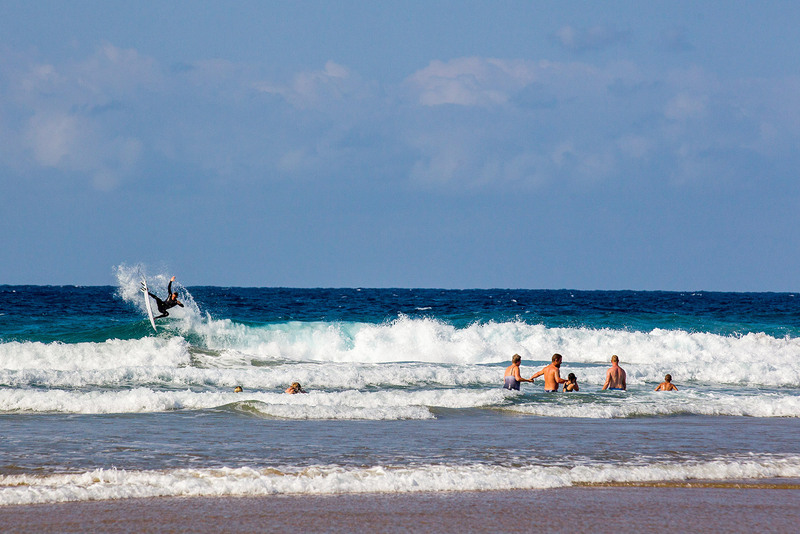 The kid just rips all day long in every single way. Looking forward for the next trip with this awesome amigo!" It was so rad to get to know Bryan. 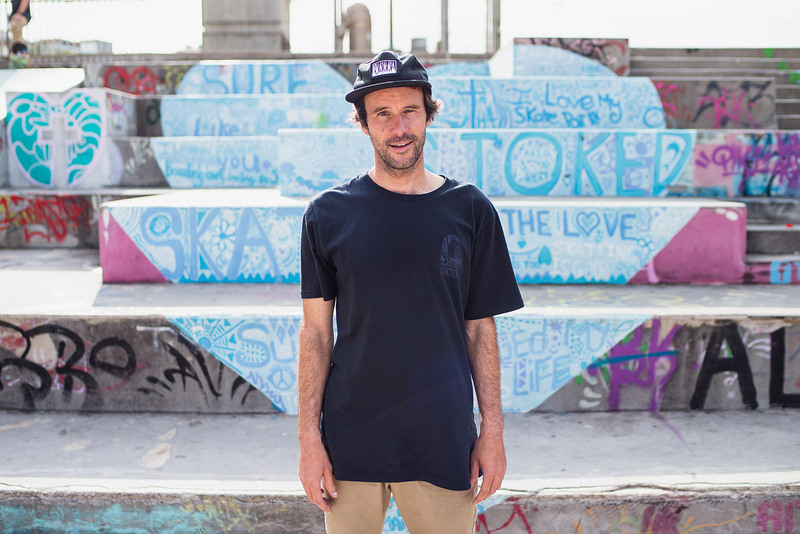 It's not often you have someone who keeps the stoke going for literally everything. His energy and love for life is off the charts! Probably why he falls asleep every time we get in the van. 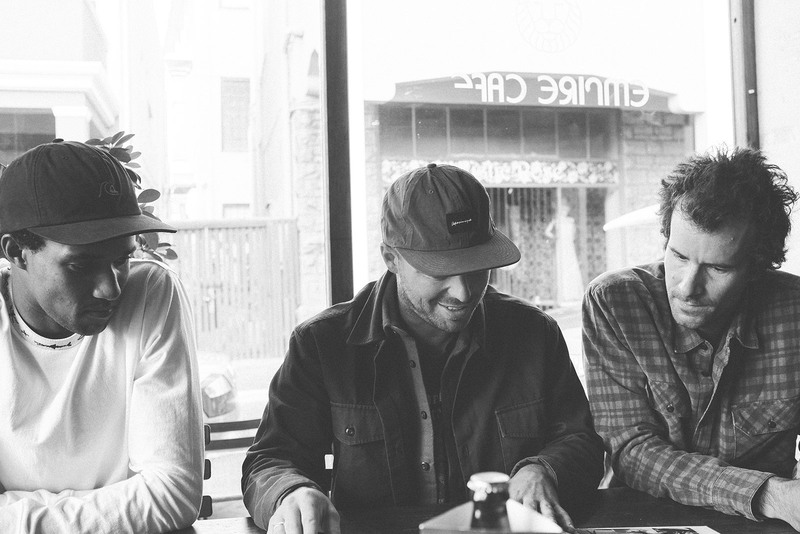 Frothing for every session, every adventure, keeping the boys laughing and hyped. If he charges this hard surfing, I can't wait to go snowboarding with him! What a legend. Hopefully I'll be like him when I grow up. "Mikey is a great kid, really glad I got to hang with him....Watching him surf was epic, so relaxed and confident, seems he can do whatever he wants on a wave. In a time where every talented kid has an ego the size of New York, it's refreshing to meet a kid like Mikey who is respectful and appreciative, seeming to not let any of it go to his head. 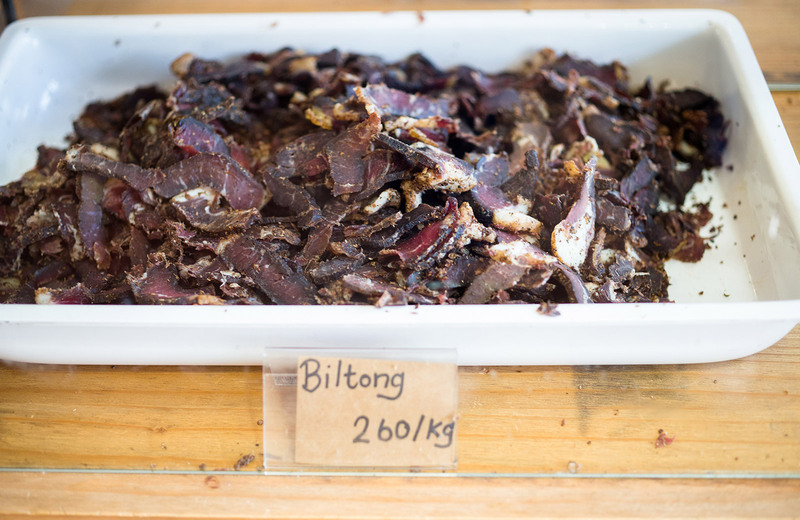 Thanks for the mental trip and endless biltong M.Feb." 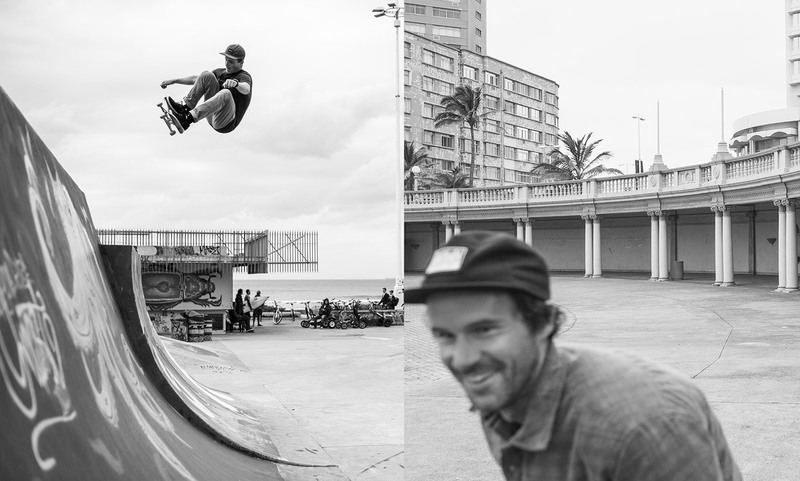 "One day we went to a friend of Javier’s in Durban to skate a backyard pool. It was tiny and looked super hard to skate. 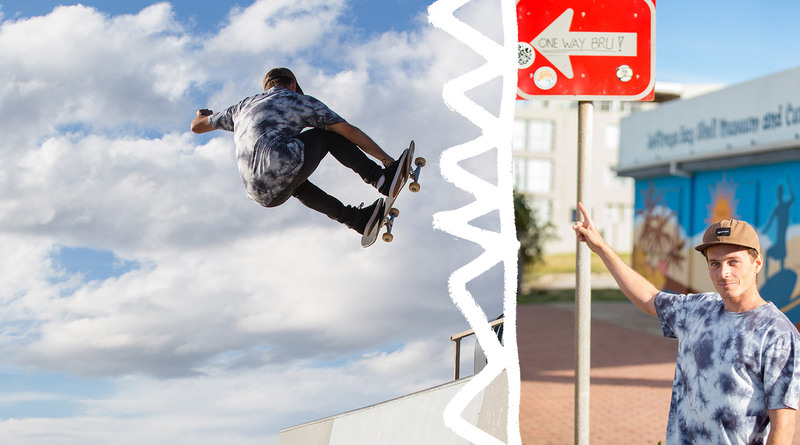 Javi had a trick in mind that he wanted to land and he couldn’t quite get it. It was painful to watch, every time he failed an attempt he would hit the concrete so hard. Some I wasn’t sure he was going to get up. After an hour or so, everyone got food and beers and all started losing attention, but Javi was in his own world, nothing could distract him, he just kept trying. Slam after slam. Maybe another hour past and we had all almost lost hope, some of us were packing up to leave. And then, he landed it perfectly. It was like he won a battle. He needed to prove it to himself so he did again, one more time, perfect again. For me, that kind of dedication was so inspirational to watch. He was 100% committed and was never giving up. Knowing he's been skating for more than 20 years and is still pushing himself like this is incredible." "Lee Ann Curren, what a legend! She has such a welcoming, warm soul. It was so rad to have her on this trip. It really put a positive twist having her here with all the boys. Watching her surf J-Bay was honestly mesmerising. She was the first one out every morning, showing everyone how it’s done. Sure, it might be in her blood, but Lee-Ann is amazing in her own way. Her style, her music, her outlook on life. 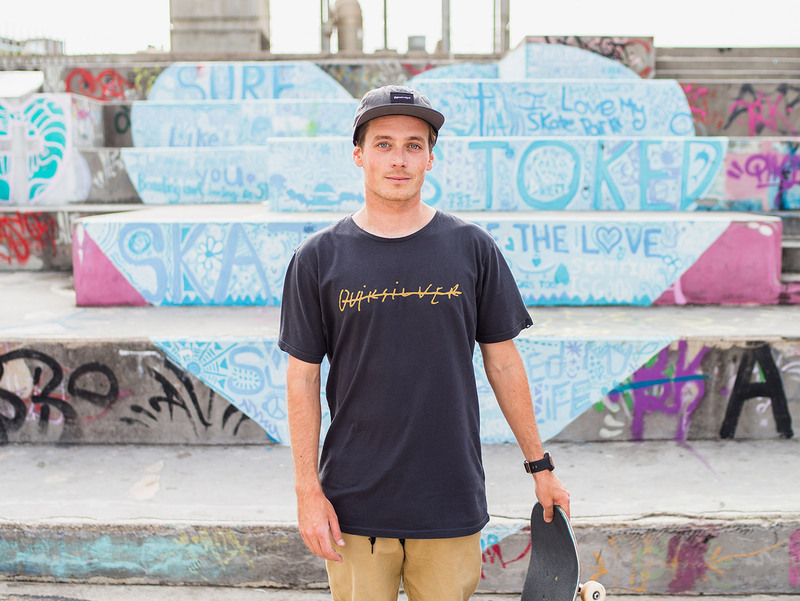 Stoked to know you"
"Usually when I watch Matt surf, it’s via my laptop while he takes on the World Tour. To watch him tear J-Bay apart from the lineup was something special, especially considering it was where he injured himself exactly one year ago. 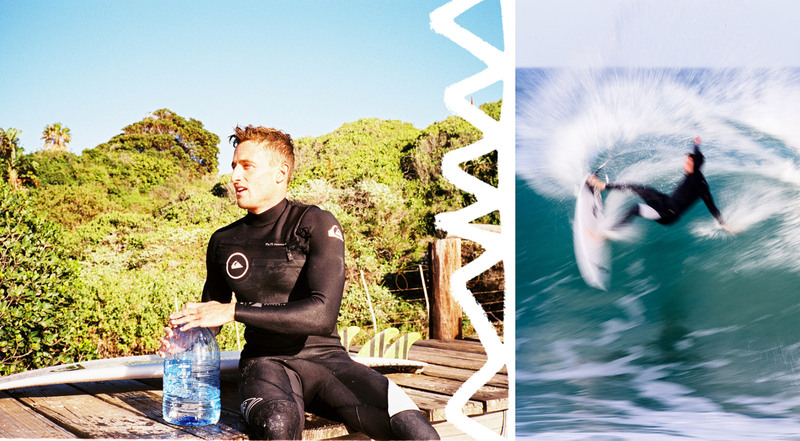 Banting is super professional when it comes to his surfing, but he also has the perfect balance of work and fun totally figured out. It was cool to get to know Matt out of the water. 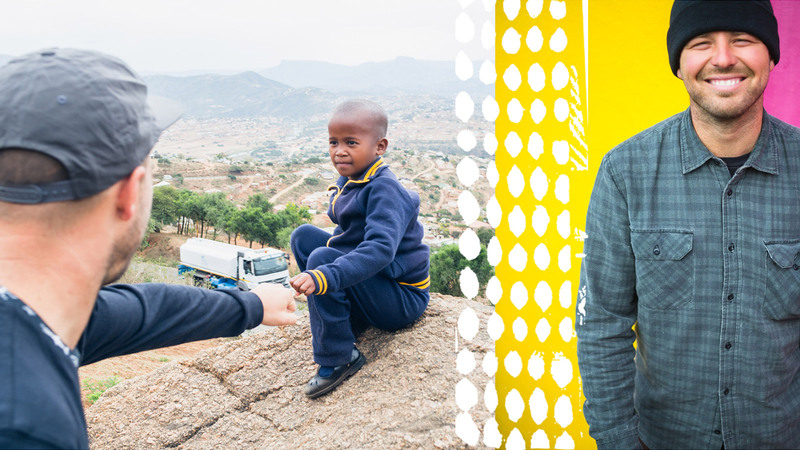 He loves hip hop, shreds on a skateboard and without a doubt ate twice as much as anyone on this trip…He’s always hungry! Matt is a legend to be around, it was epic to hang out with him in my home country"
South Africa offers some of the best food worldwide. Expect meat on meat on meat. Add the fast that they host the second biggest Indian population in the world and you've got a very delicious combination of flavours. No, this ain’t no rabbit food. 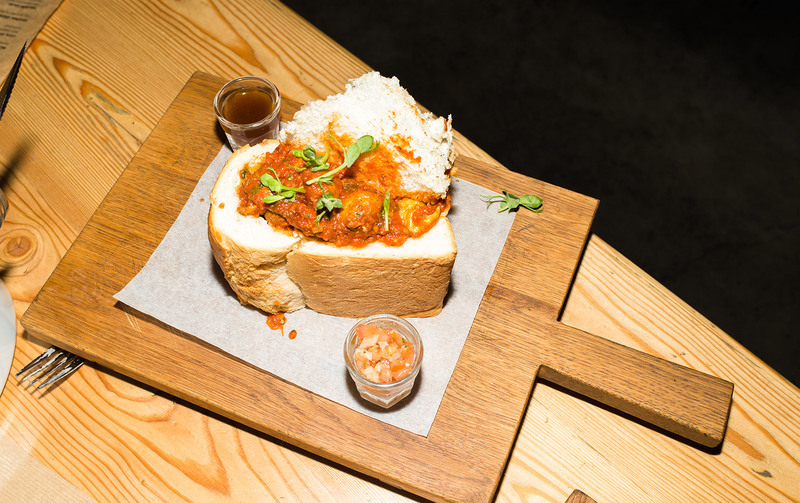 Bunny chow or Bunny is a South African fast food delight. 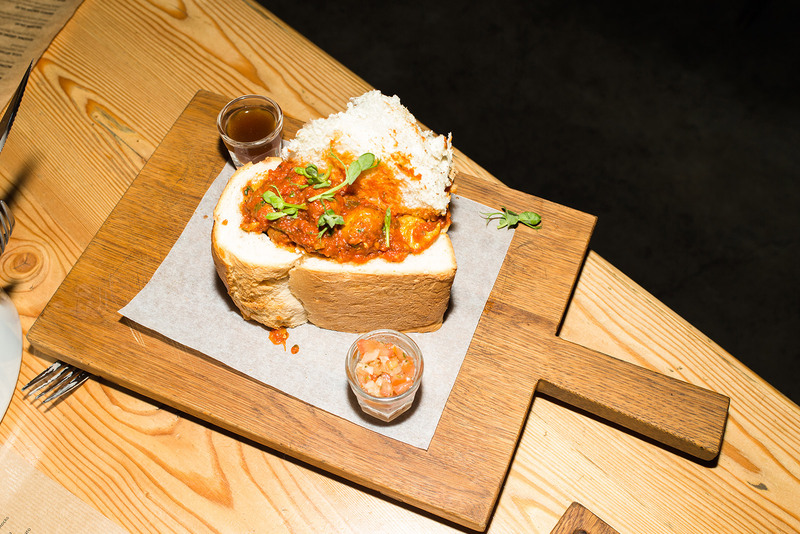 Originating in the indian communities of Durban, an uncut loaf of bread is crammed with a chicken, lamb, or kidney bean mix. 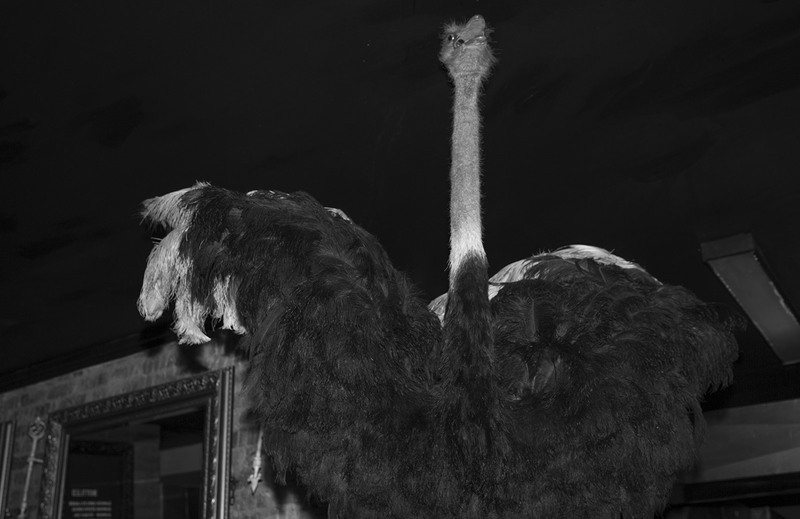 Considering South Africa has been deemed the ostrich capital of the world, why not make the most it. And what better way than to serve it up on a plate. This big bird cooks up like premium beef. Red meat thats iron rich and perfect on a burger or with a side of fries. 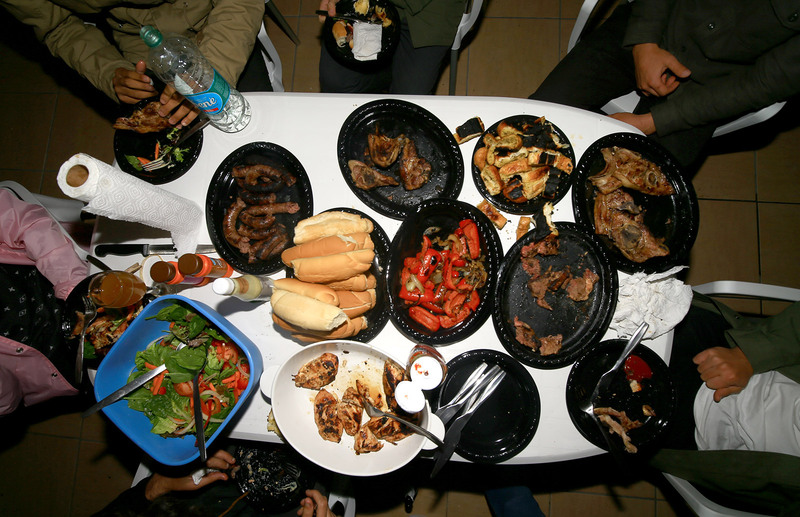 Afrikaans for “barbecue”, a Braii is a South African feasting custom. Plates of meat are cooked using a grill, prepared in a oven fired by wood or coal. Traditional meats include borworse, chicken, lamb, steak. It’s about chasing a feeling. 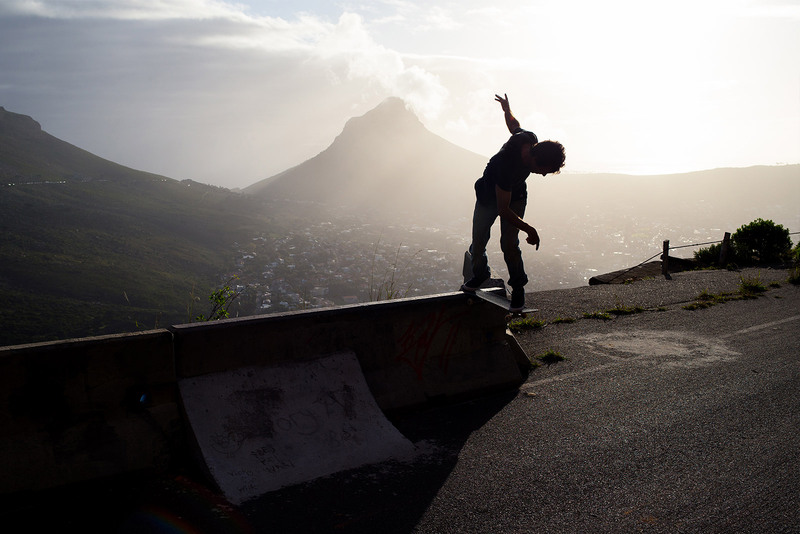 The feeling you get when rolling down the windy hills of Capetown on four wheels and some wood. Or looking down an endless line of Indian Ocean unfolding and exploding on your first wave at J-Bay. Or surrendering to the urban pulse of Durban for a busted-open night full of anything. It’s about choosing what’s bold instead of what’s easy. It’s about feeling the high. We felt it in South Africa. The thrill of living. And now it’s about keeping that high. Using it as a reason to go see what’s around the next bend. What life looks like buckled in at the top of that peak, paddling into the next set or dropping into an unknown pool. That’s a style of life worth living. And that’s what our lifestyle is all about.